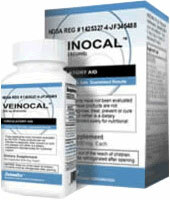 Manufactured by Selmedica Healthcare, Veinocal is an all-natural botanical product developed to treat varicose veins. Selmedica claims the ingredients they use to develop their healthcare products are carefully tested for their effectiveness in treating certain conditions. Veinocal is also believed to be much more economical than some of the more popular surgical treatments for varicose veins. The proponents of Veinocal claim this herbal formula works to get rid of existing varicose veins while preventing the onset of future varicose veins and preventing the pain and swelling often associated with this condition. To achieve this end, the makers of Veinocal also claim this product fights the destructive enzymes thought to be responsible for causing varicose veins by working on both the external symptoms and internal factors associated with varicose veins. Stomach problems are the most common side effect associated with Veinocal, but no others have been cited. However, due diligence should be taken when considering Veinocal as side effects have the potential to arise with any nutritional supplement. Unfortunately Selmedica Healthcare, the makers of Veinocal, no longer has a website nor is there a website dedicated to Veinocal. This is likely due to the arrest of the company’s owner in March of 2008. While the makers of Veinocal seem to have gotten it right by including Horse Chestnut in their formula, the long list of consumer complaints filed with the Better Business Bureau. As a result, Veinocal is less than desirable as a treatment for varicose veins.